May 1st Move-in. First Month Rent + Deposit. 700 Block of Fairmont. Columbia Heights Near Howard University. Five/Six Blocks to U Street. Six Blocks to Columbia Heights Center. Attention Gay Men: Town and Nellies is Five Blocks or A $5 Cab Ride. Fairmont Street is really quite attractive and the interior yards of Howard’s Campus are a delightful walk, as is a lap or two in the Banneker Pool. The street is great, the area on the rise. Access to the aparment from front or rear. There are steps to both entrances, but the view is awesome, as is the breeze as we are way above the swap. Spacious one bedroom apartment featuring new modern amenties (such as Central Air and Heat), but within a charming 1920s rowhouse. 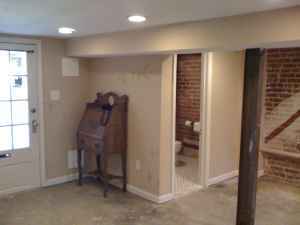 English basement entrance in front with a fully exposed 1st Floor Appearance in back. Both elevations open onto garden with the back being an ample amount of outdoor space for a small dog or rabbit. The yard is fenced. A sizeable porch extends from the rear and upper porches of house-porches can also be used within reason. The rear garage also features a pergola on the roof beyond the rear gate looking on to the funky uban view with DC in the back ground. An old horse trough gone fountain will be tinkling in the back ground. The interior features include exposed brick, plaster-like walls (painted), with glazed concrete floors and black and white poreclain tile in the bathroom. We have been very green in the reuse and retrofiting of interesting old wood doors, sinks, and raw materials within the building. The layout includes a large open room for living and dining with a small vintage bathroom (newly installed/standup shower), a galley kitchen with new stainless-eque appliances/ white cabinets, and a separate bedroom accessed through double pocket doors (includes closet). All of the exterior apatures are glazed as to maximize lighting possibilities. Galley kitchen features new appliances W/D, oven/stovetop range, overhead microwave and ventilator, standard size fridge and obviously a sink with hose/spray nozzle and garbage disposal. 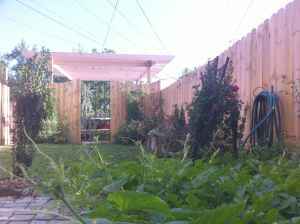 Current tenant and upstairs roomate use some of the exterior rear yard for planting veggies, etc. The new occupant is more than welcome to partake in pleasure gardening. A pet or two is welcome, but we don’t want a Great Dane convention. Now that’s an ad! Hahaha. Wow. $1350 sound reasonable for this 1 bedroom?